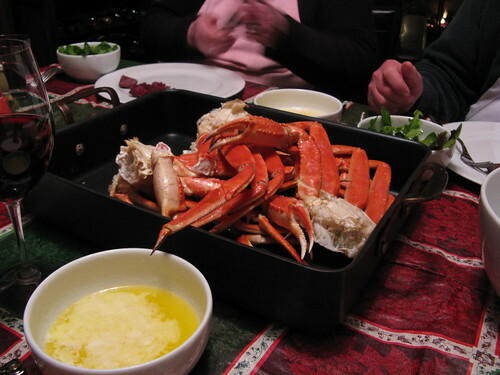 On New Year's Eve my dad offered to treated us to a crab leg feed. We are big fans of that sweet, rich shellfish. So, we covered the table with a big vinyl cloth, roasted some potatoes & melted lots of butter. Then we roasted 6 lbs of snow crab clusters & dove in. Yes, you read that right we roasted them. 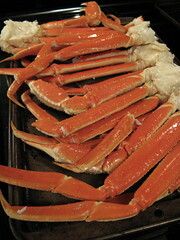 I know it sounds odd & most people steam crab legs but we find roasting them is a simple way to reheat precooked legs. Place legs on a baking sheet & brush some olive oil on the shells. Bake for 8 minutes & serve. Looks delicious. What a fun feast to have in the new year! Love your blog! I've left you a "One Lovely Blog Award" on my blog. Keep it coming!! We had a seafood New Years too. Calamari and shrimp. Yum! I think next year we shold do crab! It looks so good! I always thought crab was a big deal to prepare - clearly not. Such a fun thing for a family activity and delicious too. Crab legs are one of my favorite things!! Yum, is it dinner time yet? I find crab to be tastier than lobster...really. What a feast. 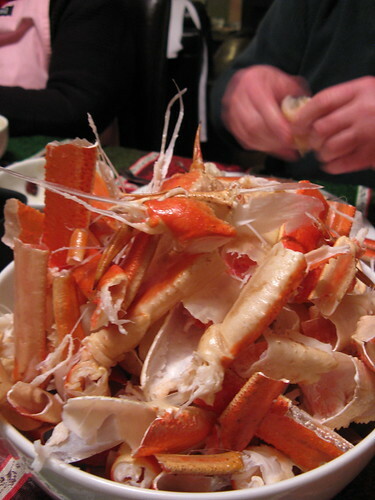 Nothing beats just digging into crab. Perfect! Thanks for the tip re roasting the crab legs. Just buying the legs looks so much easier than mucking around with the body shells! Thanks... I'm thinking this may be a Christmas feast. Beth - They were precooked but not frozen before roasting. It was a great holiday feast for us.